These perfectly balanced blends of fruit, wine and balsamic vinegar are incredibly versatile glazes. 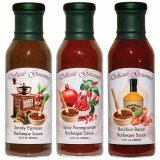 They are terrific on your favorite panini or sandwich, great as a finishing sauce over grilled meats, poultry & seafood and fabulous drizzled over pate, salad or your favorite cheese. They are also perfect as a dessert sauce over ice cream, pound cake and fresh fruit, or as a topping for cheesecake. Includes: Blueberry Chardonnay, Raspberry Merlot and Strawberry Zinfandel Balsamic Glazes. 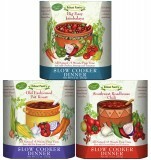 For a fantastic BBQ experience try our delicious sauces. Includes: Smoky Espresso, Spicy Pomegranate and Bourbon Bacon Barbeque Sauce. Terrific served as appetizers over toasted garlic and oil rubbed country or Italian bread. Best served hot off the grill or fresh from the broiler. Also great added to pasta, quiche or as a pizza topping. Includes: Sun-Dried Tomato & Basil, Sun-Dried Tomato & Olive and Sun-Dried Tomato & Roasted Red Pepper Bruschetta Toppers. Try our irresistible chocolate liqueur dessert toppings on ice cream, cheesecake, pastries or crepes. Includes: Chocolate Raspberry Liqueur, Black Forest Chocolate Liqueur and Espresso Chocolate Liqueur Sauces. These unique jellies are delicious over cream cheese with crackers or blended with cream cheese in a tortilla wrap. Irresistible on bagels, croissants and muffins. Includes: Hazelnut Coffee Jelly, Mocha Coffee Jelly, Vanilla Latte Coffee Jelly and Vanilla Chai Tea Jelly. For easy entertaining, our Jalapeno Jellies are fabulous as a dip for appetizers. Serve over cream cheese or goat cheese with crackers. Great as a sandwich spread and glaze for entrees. Heat and serve over meat, poultry, seafood, vegetables and rice for a tantalizing taste senstation. Stir into pan juices to create a rich sauce for beef, chicken and pork entrees. Includes: Red Pepper Jalapeno, Key Lime Passion Fruit Jalapeno and Raspberry Jalapeno Jellies. Our best selling mustards are terrific as glazes for poultry, meat and fish. They are wonderful as dips for pretzels and vegetables or as sandwich spreads. Includes: Roasted Garlic Horseradish, Raspberry Wasabi Honey, Bourbon Bacon and Sun-Dried Tomato & Olive Mustards. Just heat and toss these gourmet sauces with your favorite pasta. Amazing on homemade pizza or over grilled fish or poultry. Includes: Sun-Dried Tomato & Basil Pasta Sauce, Puttanesca Pasta Sauce, and Vodka Pink Peppercorn Pasta Sauces. These flavorful dressings are terrific over your favorite salads. Add crumbled goat or blue cheese for a unique flavor experience. Includes: Mango Poppy, Greek Mediterranean and Smoky Tomato Salad Dressings. These sensational savory delights are exceptional over cream cheese with crackers. Used as a spread, they also enhance your favorite sandwiches. Includes: Bourbon Bacon, Raspberry Horseradish Jam, Roasted Red Pepper Jam, Roasted Garlic Balsamic Savory Jams. Season meat, poultry, fish and vegetables with your favorite Sea Salt Rub by lightly rubbing into the surface. Includes: Chicken & Poultry, Steak & Roast and Fish & Seafood Sea Salt Rubs. Try our Slow Cooker Dinners Collection they include our Big Easy Jambalaya, a delicious spicy dish that brings the colorful taste of Mardi Gras to your dinner table. Also Old Fashioned Pot Roast, the beefy rich flavor of this traditional pot roast feast takes us back to Moms kitchen and our Southwest Roadhouse Chili, this culinary adventure to the Southwest brings the best chili flavors to your dinner table. 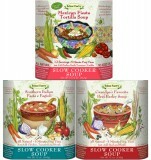 Try our Slow Cooker Soup Collection they include our Mexican Fiesta Tortilla Soup. This Mexican soup is irresistibly delicious and exploding with south of the border flavor. Southern Italian Pasta e Fagioli is frequently served in the finest restaurants. This delicious soup has its origins in the peasant villages of Tuscany. Our Grandpa's Favorite Beef Barley Soup is deliciously hearty and filling. Enjoy four of our best selling spirited fruit jams and jellies that are also wonderful as dessert toppings. Includes: Burgundy Wine, Strawberry Sangria, Mango Margarita and Pina Colada Rum. Our delicious Tapenades make wonderful spreads for garlic bread. Mix with oil and vinegar for great vinaigrettes. They make excellent condiments for roasted or grilled meat or poultry. Also great added to pasta, quiche or as a pizza topping. Includes: Artichoke Parmesan, Black & Green Olive and Roasted Red Pepper with Goat Cheese. For effortless appetizers, serve with warm country or grilled garlic bread. Toss with penne or fusilli pasta. Terrific as fillings for omelettes. Serve over cream cheese with crackers. Includes: Artichoke Simmered with Zinfandel, Olive Medley Chardonnay and Sun-Dried Tomato Merlot.